Special Interests in Fernando de Noronha. So, you've been planning a trip to Fernando de Noronha and you've special interests other than surfing, diving, snorkelling and enjoy the sunny beaches? Kayaking is possible; with tours leaving daily from Porto do Antonio, for about 3 hour sessions. 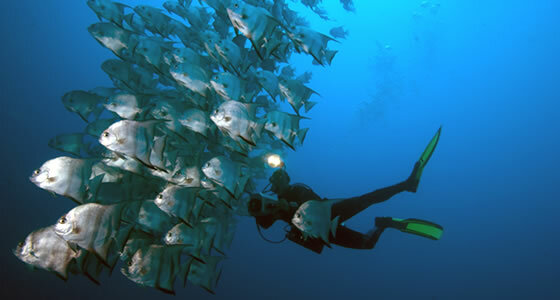 Another interesting and more active option is to take a planasub/aquanaut tour, which is a cross between snorkeling, water skiing and diving. You hold on to a plastic board and are towed behind a fast boat. By adjusting the angle of the board you can either go underwater or come up for air when you are out of breath. Operators usually take groups of 6 – 8 on these tours and each person is allowed half an hour of planasubbing. Deep sea sport fishing – mainly mackerel and blue marlin – is also available for avid anglers. In fact every August, Fernando de Noronha hosts the Ocean Fishing Championship, while September sees the annual Ocean Regatta, when around 40 sailors set sail from Recife to Noronha, a distance of around 300 miles. Fernando de Noronha is the largest bird breeding colony of all the tropical South Atlantic islands and thus is an excellent place for bird watching. Besides the island’s 2 endemic species, the Noronha Elaenia and the Noronha Vireo, several migratory birds that flock here include the black noddy, which uses algae found on the ocean’s surface to build its nest in cliffs and trees on the island, sooty tern, brown, masked and red-footed booby, fairy tern, as well as the long tail feathered magnificent frigatebird and red-billed tropicbird. Land birds also include the eared dove and cocoruta.Mountain biking, which is a great way to explore the island’s flora and fauna is also popular and bikes can be rented from several places. Take A Break At Noronha.